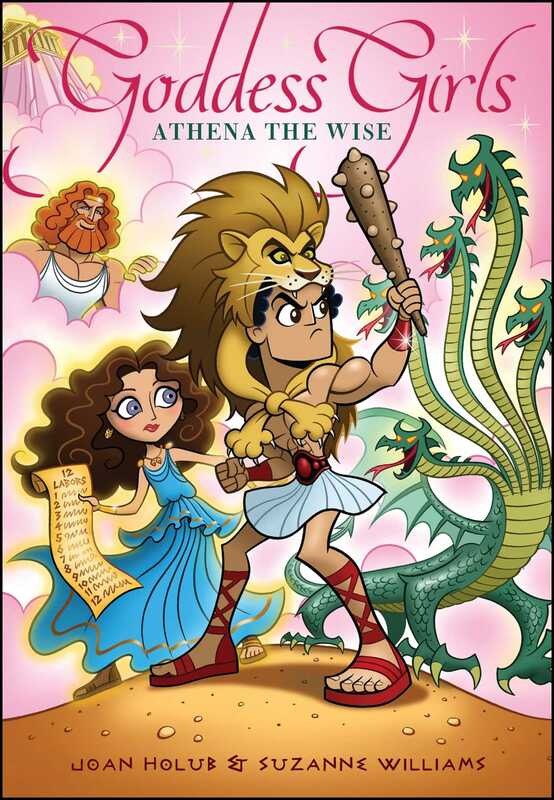 Athena uses her wisdom to help out a new kid—who happens to be Hercules—in this Goddess Girls story. When a mortal named Hercules transfers to Mount Olympus Academy, Athena wants to help him fit in. Not only does Hercules need help finding friends and adjusting to life at his new school, but he must also complete twelve “labors” in order to earn a permanent place at the academy—and a shot at achieving immortality. Athena’s dad, Principal Zeus, takes an interest in the new kid and asks his daughter to secretly watch out for him as he tries to complete his tasks. It will take all of Athena’s famed wisdom to sort out her own problems and help Hercules succeed! WHO’S THAT?” ATHENA ASKED, GESTURING toward an unfamiliar boy as she plunked her tray onto the table where she and her goddessgirl friends always sat for lunch. The entire cafeteria at Mount Olympus Academy was buzzing with excitement over him. Usually she didn’t pay much attention to boys, but even she couldn’t help noticing this one. Dressed in a lion-skin cape—its jaws fit his head like a helmet—he was tall with dark, curly hair, and bursting with muscles like Atlas, the school’s champion weightlifter. Athena took a bite of her hero sandwich. A lion cape was perhaps overkill as a fashion statement. She frowned in his direction. “Word is that he’s mortal, just like Orion. So maybe he’s a liar, too.” Orion had been her disappointing first crush, too stuck on himself to notice anyone else’s feelings—especially hers. Now she tended to look upon all boys with suspicion, particularly those who reminded her of Orion in any way. Persephone took a sip from her carton of nectar. “So he’s mortal and he dresses weird. That doesn’t mean he isn’t nice.” She was sensitive about stuff like that. Probably because her crush, Hades, had often been misunderstood just because he came from the Underworld. A burst of admiring laughter came from the table where Heracles sat, drawing the girls’ eyes. He seemed to have wasted no time in making new friends among the godboys. Several of them, including Hades; Artemis’s twin brother, Apollo; Ares; and Poseidon were hanging on his every word. Athena couldn’t quite hear what Heracles was saying, but whatever it was probably involved weapons, war, sports, or hunting. In her experience, those were the topics that interested godboys most. Sure enough, moments later Heracles passed around his big, knobby club, which the boys oohed and aahed over. Not to be outdone, Poseidon showed off his trident, and Apollo, his bow. Aphrodite, Artemis, and Persephone leaned toward her, as if anxious to hear what she had to say. Athena hesitated. She could well remember how nervous she felt when she first came to MOA less than a year ago. Most of the godboys and goddessgirls here, including her three best friends, had been together for years by then. They were all so beautiful, handsome, gifted, and amazing. If she’d suspected at the time that they were discussing her—sizing her up and making judgments—she would’ve felt way more nervous. “Words of wisdom from the goddessgirl of wisdom herself!” added Artemis. “Thanks,” Athena told them. The praise was nice, but honestly, although she knew she was brainy, she wasn’t so sure she deserved the title of goddessgirl of wisdom. If she were truly wise, she wouldn’t have made all the mistakes she’d made since she’d been here at MOA—like flooding the Earth with inventions, taking on too many classes and extracurriculars, and turning Medusa’s hair into snakes. Besides, words meant nothing without action. So far, she hadn’t done anything herself to welcome Heracles. Well, she could change that. Every eye in the cafeteria swung her way. Athena gulped. Zeus was never one to say please, especially if he was displeased about something. After all, he was King of the Gods and Ruler of the Heavens, so manners were not his first priority. “Change of plans, everyone. I’ll see you later.” Leaving her tray on the table, Athena hurried out the door. Even though—or maybe because— Principal Zeus was her dad, she worried about pleasing him more than anyone else at MOA did. Her stomach did acrobatic flips as she rushed down the hall to his office. She racked her brain trying to think if she’d done something wrong. She was making straight As, so surely none of the teachers had complained. But her dad wasn’t big on friendly fatherly talks or idle chitchat, either. So what could he possibly want?